Late afternoon, Friday and the doorbel rings. It is the mailman, "Hi, is this Casa Robino, I have a package for you". I feel surprised and wonder what it would be as I walk down to the front-door. The amazement grows tremendously as soon as I open the door and see the mailman with a GIANT package in his arms. While walking back up, my excitement increases too. What could it be? What would be in it? While I slowly walk the stairs I check the box but there is nothing really on the square thing that reveals its contents; I can hardly wait to know and the curiosity grows even more. could show us how dumpster diving in the Netherlands is. Are there any people in Casa Robino interested in taking us on a dumpster diving tour? The time: mid April, I’m hitching from Texas to Chicago to meet my Czech friend, Roman. We’ll be hitchhiking together through the Midwest to the west coast, San Francisco to be specific, where we’ll split. Morning, Roman and I are trying to get to Colorado. We’ve spent last night camping under a bridge, in a small town in the middle of nowhere, Wyoming. Now we’re trying to get the hell out of there. 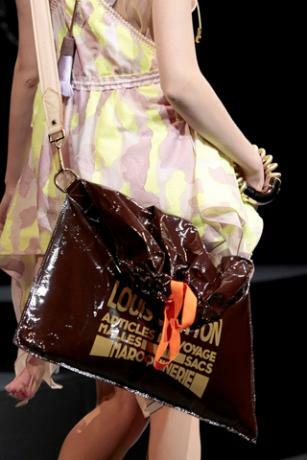 Louis Vuitton's new "Raindrop Besace" handbags, retailing for $1,960.00 USD, look exactly like trash bags with leather straps. Sometimes I just think my right foot is Estonia.